Christmas Carols are meant to get us in the holiday spirit, but have you ever really listened to the words of these yuletide classics? Most of these songs are about accidents, adult pleasure or slaying people. Lyrics about poverty, suspected adultery, giant snow creations springing to life — it's horrifying. What are the worst Christmas songs ever? These songs are ones we hear piped throughout giant shopping centers, in lobbies, on the radio, the background music of our celebrations and holiday parties but what are they really saying? Here are the most horrifying Christmas song lyrics of all time. Okay, sure, this is meant to be somewhat whimsical, but think of the visual: a kind, wonderful, loving old woman is walking home on Christmas Eve, and then she gets run over by a reindeer. 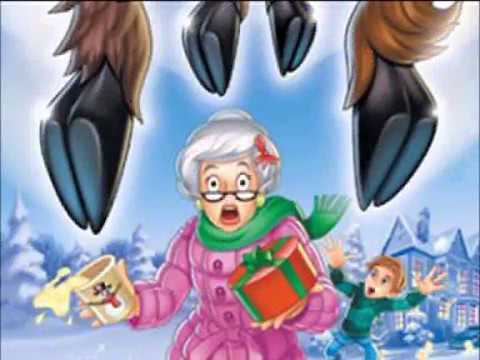 "Grandma got run over by a reindeer. But as for me and Grandpa, we believe." So Grandma perished because of the accident? But reindeer fly, so how did they run her over? This song brings up a whole bunch of logistical questions. This song, by the way, after studying this last phrase, fits perfectly into Christmas because of the modern Christian value of if you don't believe in Jesus, you are shunned. Grandma didn't believe in Santa Claus. And incriminating Claus marks on her back." So, it was a calculated incident. This song is about the most kind, benevolent fictional character of all time that spends his entire life making and delivering toys to children taking time out of his schedule to slay an old woman (who isn't even part of his target audience). Drinkin' root beer and playin' cards with cousin Belle." So Grandpa's just fine with this, apparently. The concept of Santa Claus moonlighting as an assassin for hire is not only terrifying because of his supernatural powers of light speed and work ethic, but because he can see us when we're sleeping, and when we're awake. This sounds like a threat. This entire song is a threat. Santa does sound a little too focused on watching little kids, and this all sounds very threatening, what exactly is going to happen to kids when Santa comes to town? But what really makes this song disturbing lies in the fact that there's an everpresent being watching children 24/7, and that if they screw up once, even once, then they don't get to enjoy what is easily the most joyous season of the year in the West with the rest of the world. If you don't live by this weird, fat, bearded guy's rules, you have nothing but coal, trauma, alienation, and social exclusion to look forward to during the holidays. Why do we even need God if we have Santa Claus? Eartha Kitt sang the original version of this song in 1953. It's the sexiest Christmas song, but operates under the guise of what is basically a proposition for trading pleasure for goods. We've already seen Santa take money for slaying on this list, and in this song, we assume he can be bought with adult pleasure. This song is about a gold digger. She asks for a platinum mine in this song, and that's before she asks for something from Tiffany's. And then she wants more. This is the greediest person alive, and she's willing to sleep with Santa Claus to get whatever she wants. Yachts, a deed to the house, a duplex and checks as stocking stuffers? If your true love is sending you a total of 23 birds, 49 people, and five golden rings you may want to consider finding a new true love because this one is involved in black market dealings or is one of those brash, irresponsible billionaires.